This past Sunday we celebrated the promotions of our children and youth to their next grade in Sunday School! 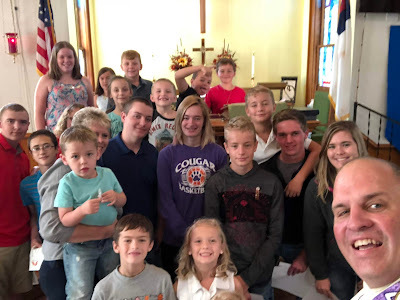 We took a Sunday School selfie after everyone received their awards. A Big thank you to our Sunday School Director, Deb Marlette, for her ministry of leadership and service! Sunday morning was the start of our school year; we are excited and thankful for the ministry of our teachers! Sunday school starts at 9:15 am every Sunday morning; all are welcome! In addition to having a cookout to celebrate the start of the school year after our worship service, we blessed the backpacks during worship. It was a fantastic start to an exciting year at Geneva United Methodist Church - we hope to see you there!